Rules laid down by R. Eliezer b. Jose ha-Gelili for haggadic exegesis, many of them being applied also to halakic interpretation. 1. Ribbuy (extension): The particles 'et," "gam," and "af," which are superfluous, indicate that something which is not explicitly stated must be regarded as included in the passage under consideration, or that some teaching is implied thereby. 2. Mi'uṭ (limitation): The particles "ak," "raḳ" and "min" indicate that something implied by the concept under consideration must be excluded in a specific case. 3. Ribbuy aḥar ribbuy (extension after extension): When one extension follows another it indicates that more must be regarded as implied. 4. Mi'uṭ aḥar mi'uṭ (limitation after limitation): A double limitation indicates that more is to be omitted. 5. Ḳal wa-ḥomer meforash: "Argumentum a minori ad majus," or vice versa, and expressly so characterized in the text. 6. Ḳal wa-ḥomer satum: "Argumentum a minori ad majus," or vice versa, but only implied, not explicitly declared to be one in the text. This and the preceding rule are contained in the Rules of Hillel, No. 1. 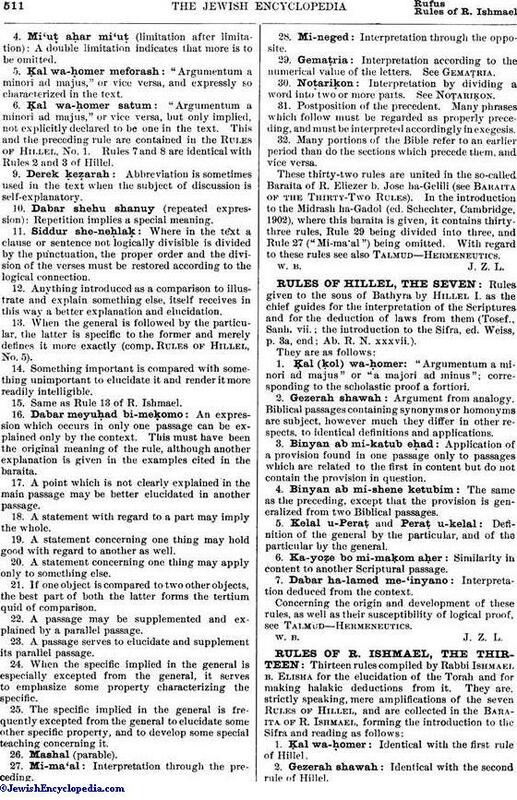 Rules 7 and 8 are identical with Rules 2 and 3 of Hillel. 9. Derek ḳeẓarah: Abbreviation is sometimes used in the text when the subject of discussion is self-explanatory. 10. Dabar shehu shanuy (repeated expression): Repetition implies a special meaning. 11. Siddur she-neḥlaḳ: Where in the text a clause or sentence not logically divisible is divided by the punctuation, the proper order and the division of the verses must be restored according to the logical connection. 12. Anything introduced as a comparison to illustrate and explain something else, itself receives in this way a better explanation and elucidation. 13. When the general is followed by the particular, the latter is specific to the former and merely defines it more exactly (comp. Rules of Hillel, No. 5). 14. Something important is compared with something unimportant to elucidate it and render it more readily intelligible. 15. Same as Rule 13 of R. Ishmael. 16. Dabar meyuḥad bi-meḳomo: An expression which occurs in only one passage can be explained only by the context. This must have been the original meaning of the rule, although another explanation is given in the examples cited in the baraita. 17. A point which is not clearly explained in the main passage may be better elucidated in another passage. 18. A statement with regard to a part may imply the whole. 19. A statement concerning one thing may hold good with regard to another as well. 20. A statement concerning one thing may apply only to something else. 21. If one object is compared to two other objects, the best part of both the latter forms the tertium quid of comparison. 22. A passage may be supplemented and explained by a parallel passage. 23. A passage serves to elucidate and supplement its parallel passage. 24. When the specific implied in the general is especially excepted from the general, it serves to emphasize some property characterizing the specific. 25. The specific implied in the general is frequently excepted from the general to elucidate some other specific property, and to develop some special teaching concerning it. 27. Mi-ma'al: Interpretation through the preceding. 28. Mi-neged: Interpretation through the opposite. 29. Gemaṭria: Interpretation according to the numerical value of the letters. See Gemaṭria. 30. Noṭariḳon: Interpretation by dividing a word into two or more parts. See Noṭariḳon. 31. Postposition of the precedent. Many phrases which follow must be regarded as properly preceding, and must be interpreted accordingly in exegesis. 32. Many portions of the Bible refer to an earlier period than do the sections which precede them, and vice versa. 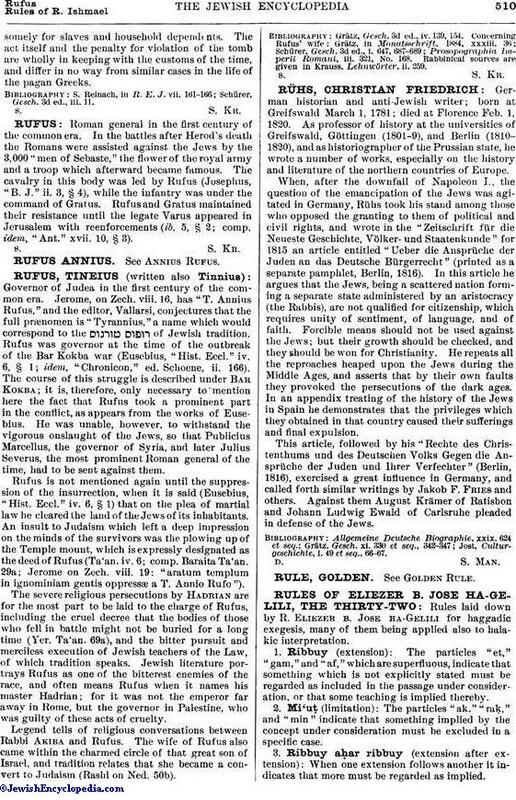 These thirty-two rules are united in the so-called Baraita of R. Eliezer b. Jose ha-Gelili (see Baraita of the Thirty-Two Rules). In the introduction to the Midrash ha-Gadol (ed. Schechter, Cambridge, 1902), where this baraita is given, it contains thirty-three rules, Rule 29 being divided into three, and Rule 27 ("Mi-ma'al") being omitted. With regard to these rules see also Talmud—Hermeneutics.